EMF » C.R.A.S.H. study: A randomised study of tissue oxygenation in an ovine model of haemorrhagic shock comparing the effect of colloid, fresh red cells, aged red cells and saline. Emergency Medicine Foundation > Projects > Queensland > C.R.A.S.H. study: A randomised study of tissue oxygenation in an ovine model of haemorrhagic shock comparing the effect of colloid, fresh red cells, aged red cells and saline. C.R.A.S.H. study: A randomised study of tissue oxygenation in an ovine model of haemorrhagic shock comparing the effect of colloid, fresh red cells, aged red cells and saline. We will assess the amount of oxygen getting to the key organs (heart, brain and kidney) and how well the different fluids achieve their aim – namely to improve organ function, using other tests to show how well these organs function after fluid administration. Blood loss is a major cause of early deaths after trauma, accounting for 51% of the deaths occurring during the initial 48 hours after hospital admission. Decisions made in the early treatment of severe blood loss have important consequences for patient survival and length of time in the Intensive Care Unit. Red blood cell (RBC) transfusion is a key component of the management in acute haemorrhagic shock, based on the assumption that transfused RBCs improve delivery of oxygen to the tissues. However existing evidence suggests this may not be the case. Recent studies suggest however that transfusion of older blood may worsen both morbidity and mortality in certain patient subgroups. The aetiology behind this association shown in this retrospective study is unclear, but seems related to an alteration in risk/benefit profile of old vs new blood. Hence, this project will investigate the ability of typical fluids used in haemorrhagic shock in ED departments to improve oxygen delivery to vital organs following severe haemorrhage. i. In looking at biomarkers to measure haemorrhagic shock, the research team concluded that the measurement of serum lactate and other global markers underestimate the severity of end organ hypoxia and hypoperfusion in haemorrhagic shock. ii. 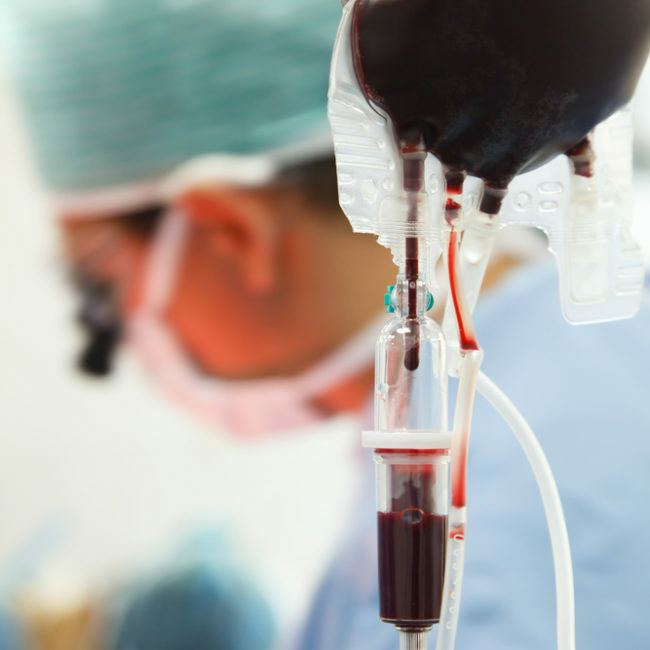 Transfusion of selenium-poor packed red blood cell (PRBC) transfusions can dilute selenium levels and compromise glutathione peroxidase antioxidant activity and thereby allow lipid peroxidation. As there was no evidence that aged PRBC induced more severe oxidative injury this suggests that selenium dilution is a key underlying mechanism. iii. Transfusion of stored ovine blood induced (1) transient pulmonary arterial hypertension but no oedema and (2) reduced fibrinogen levels more than fresh blood, but neither induced coagulopathy. Thus, transfusion of stored blood affected pulmonary function even in the absence of overt organ injury. iv. The team also demonstrated the utility of the ovine model for future blood transfusion studies and highlight the importance of compatibility testing in animal models involving homologous transfusions. - Simonova G., Tung J. P., Fraser J. F. , Do H. L. , Staib A. ,Chew M. S. , Dunster K. R. , Glenister K. M. , Jackson D. E. and Fung Y. L., "A comprehensive ovine model of blood transfusion", Vox Sanguinis, 2013;106,(2):153-160. Linked funding: "Does fluid resuscitation worsen septic shock?"